Because, really I don't already have enough hobbies? I made exactly one sweater on it before putting it away for about 25 years. In the younger Sewing Lawyer's usual fashion, the sweater was (a) without any instruction on the use of the knitting machine and (b) multi-coloured. This machine, my friends, is completely and utterly manual. I can hardly believe I did it. Behold. (Yes, it's rather loud.) I made it from many colours of Regia sock yarn. My son (not born when it was made) has appropriated it for his own, and claims to even wear it occasionally. Some years later, I found another only slightly less elderly knitting machine at a yard sale. I forget how much I paid but it wasn't more than $20. Into the closet it went with KNITKING. Until something prompted me to get them both out a few weeks ago. 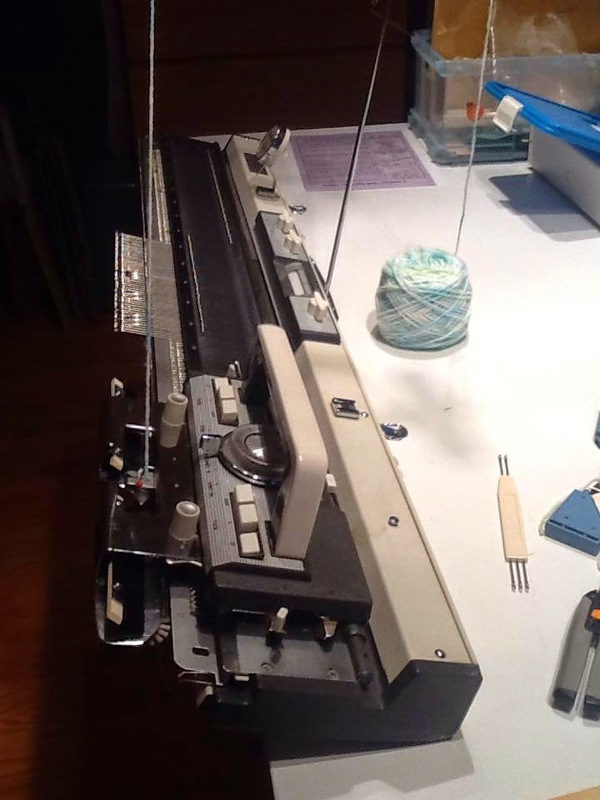 Here I was on Friday night with my "newer" knitting machine, a Studio SK-303. It's only slightly less manual - it has knobs that select certain needles. I managed to turn out a credible sample by going through the manual. I now have plans to make a much plainer lightweight merino sweater for my husband. Stay tuned. In the meantime, I finished my hand-knit project. It's a very luxurious blend of baby llama and mulberry silk. The pattern is Windswept and all details are on Ravelry. It was a pretty fun knit, all things considered. Since it is made top down I was able to weigh how much yarn was left after I had completed the body, so as to confidently make the sleeves as long as possible. I got to 8", which isn't too bad, even using most of my unravelled swatch. Too bad I'll have to pack it away until fall - it's a bit woolly for summer. I've cast off the body as you can see at left. This is shorter than the pattern intended - I like this length for a close-fitting top. And besides, I didn't have enough yarn to make it longer AND have sleeves. I shaped the body by decreasing at the sides rather than next to the lace panel. I'm happy with the fit. I used a new (to me) stretchy cast-off. It's called (not surprisingly) "Elastic Bind Off" and it's one of the stretchy ways to finish off your knitting in the book Cast On Bind Off - 54 step-by-step methods by Leslie Ann Bestor. I'm impressed with this method. It's easy, and produces a very smooth and neat edge which is, as advertised, pretty stretchy. After finishing the body, I weighed the yarn and have exactly 60g left, which means I can use 30g for each sleeve. I'm guessing they will be at least elbow-length.